Archaeobotany is the study of plant remains from archaeological sites. It is both the science and the art of recovering, identifying, and interpreting how plant remains were used in the past at archaeological sites. Archaeobotanical research, like zooarchaeological research, can help us understand historic and prehistoric people’s uses of their environment. For example, what plants they may have exploited for food, building construction, fuel use, and medicines. At the Lake Monroe Outlet Midden research revealed that these people exploited multiple habitats including a hardwood hammock with tropical and temperate broad leaf species as well as a pine flatwood habitat. Table 1 lists the primary plant species recovered from the site, which contained both charred wood and seed remains. Table 1. Primary Plant Species and Uses at the Lake Monroe Outlet Midden. 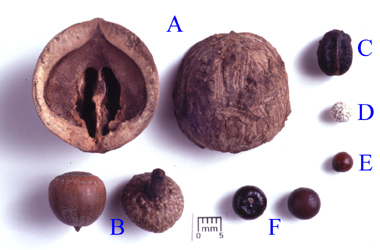 * cw=charred wood; s=seed; ns=nut shell. Table 1 also includes information about the possible uses of these species as well as which part of the plant is typically used, to help us understand the role and function of the plants recovered at the Lake Monroe Outlet midden. Overall they have edible parts such as fruits, leaves, and nutmeats and, in addition, some have medicinal and other uses. In some instances we do not have the plant part that typically is used. This, however, may constitute what we view as indirect evidence for a plant’s role at a site. For example, the presence of blueberry/sparkelberry in the wood assemblage at Lake Monroe is indirect evidence that their fruits were also available for consumption. Differential preservation of the archaeobotanical assemblage often complicates what is actually deposited and preserved, limiting what survives. Many plant parts are comprised completely of soft tissue and do not survive well in the ground; they break down or may be ingested by animals and microorganisms. In addition, consider how many fruits and vegetables are totally edible (e.g., potatoes, onions, lettuces) as well as those that we consume the seeds along with the flesh (e.g., blueberry, strawberry, grapes, squash, cucumber). In many cases, the remnants of what we don’t ingest or use are what survive in the archaeological record, nut hulls, nut shells, large pips, and other seeds. 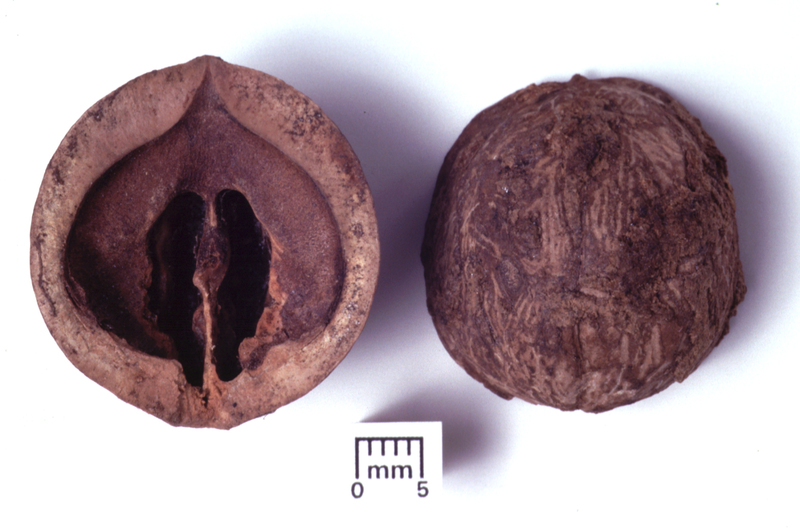 At Lake Monroe, nuts were among the most numerous plant parts recovered suggesting that they were an important part of the plant food diet along with fruits and some greens. Nutmeats of hickory [Fig. 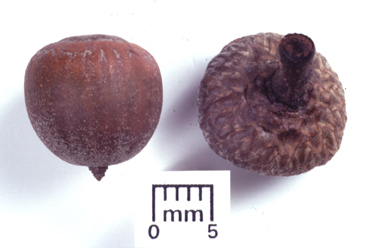 2] and acorn [Fig. 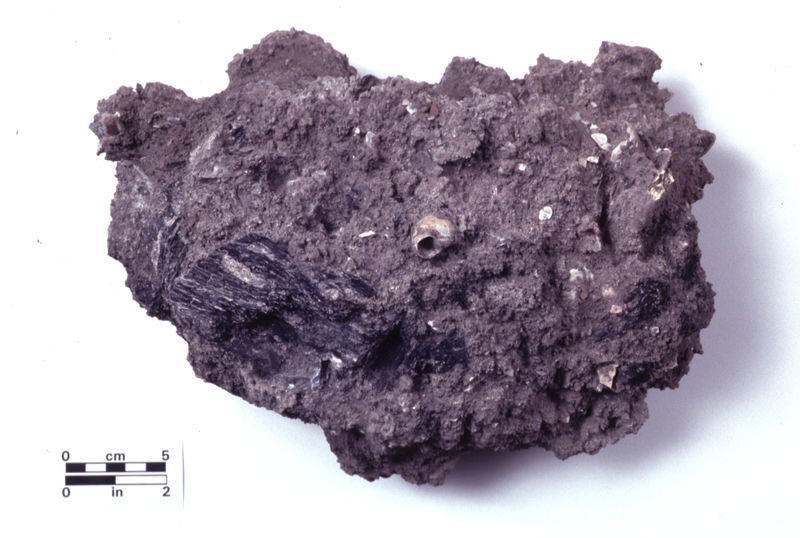 3] species provide protein and oils while shells and hulls can be used as kindling, such as in this hearth [Fig. 4] from the Lake Monroe Outlet Midden. “Hickory milk” was made by Native American groups throughout the southeastern U.S. by steeping the nutshells in water and decanting the liquid. Blueberries, hackberry, cabbage palm, saw palmetto, and greenbrier all have edible fruits although some are more fleshy and sweeter than others. (See picture gallery) Greenbrier also has an edible tuber which produces a flour called “red coontie.” The young shoots of this plant taste like asparagus and can be eaten raw or cooked. Even from this small array of plant remains you can see the potential numerous daily uses of these species. Plant preservation is enhanced in water-saturated deposits, where anaerobic (lack of oxygen) conditions exist. Two sites in this general region, Hontoon Island and Groves Orange Midden, have wet components. Some of the additional edible and usable species found at these sites include: maypop, elderberry, bottle gourd, squash, persimmon, cactus, and wild grape. The seed remains from the Lake Monroe Outlet Midden and other sites in the region dating to the Mount Taylor period have not exhibited evidence of cultivated plants such as squash and bottle gourd. Thus while the onset of plant husbandry and manipulation of plants was underway elsewhere in Florida we have not seen the archaeological evidence for this in altered seeds in the St. Johns River basin. This supports the interpretation of the plant and animal data, which suggest a primarily hunter-fisherfolk-gathering strategy. Whether or not these folks were sedentary or semi-sedentary is not yet ascertainable from the plant record, as manipulation and gardening is not apparent at this Middle to Late Archaic period site.